Khaled Pendleton/Design Assistant Over 30 different animals were showcased at the DoubleTree by Hilton hotel in Downtown Binghamton from Feb. 1 to Feb. 3. Dozens of families flocked to the DoubleTree by Hilton in Binghamton in hopes of meeting a sloth at the Natural History Exhibition this weekend. While attendees were not allowed to pet it, they were able to caress some smaller animals like ferrets, rabbits and armadillos. The Foundation for Animal Rescue and Education teamed up with Little Ray’s Nature Centres and ZooAmerica to bring the exhibition to Binghamton for the first time. It is currently on tour around the United States and Canada. The interactive exhibition, held from Feb 1. to Feb. 3, featured over 30 live animals from Little Ray’s Nature Centres in Ottawa, Canada. It is one of the largest exotic animal rescue centers in North America and specializes in educational exhibitions for various zoos, nature parks and botanical gardens. Ferrets, bunnies and guinea pigs were in pens across the room with workers at each station answering questions and letting attendees pet them while snakes, toads and other reptiles were left in enclosed habitats. Every half hour, a worker presented animals to the audience. Cameron McSheffrey, a wildlife educator at Little Ray’s Nature Centres, started off his presentation by reminding the audience about the dangers of owning exotic animals as pets. “Many of the animals we get are sent to us because their owners didn’t do research before buying them online, so make sure you always check out what an animal needs before you decide to keep it,” he said. 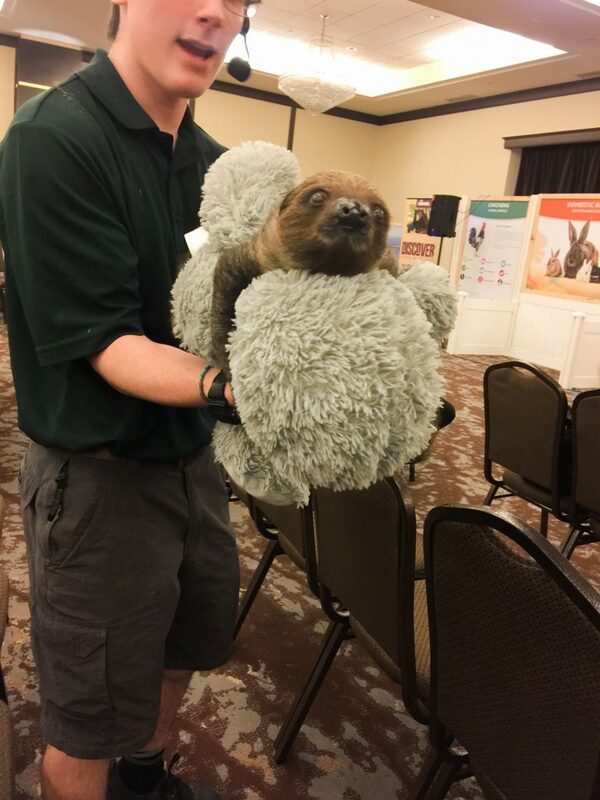 The main event was a sloth named Flash who was featured at the end of the presentations. It was carried around the room so people could take pictures of it on top of a sloth plush toy. Jennifer Pichurin, an undeclared freshman, said that her favorite part of the event was getting to pet animals like the ferrets and rabbits. As a pre-vet student, she plans to work with animals in the future. “Even though interacting with animals [will literally be my job], it’s always great to just relax and pet them for a while,” Pichurin said. However, Daniel Morales, an undeclared freshman, was upset that he couldn’t pet the sloth. McSheffrey thought that the exhibition was important to get people interested in protecting animals and treating them responsibly.